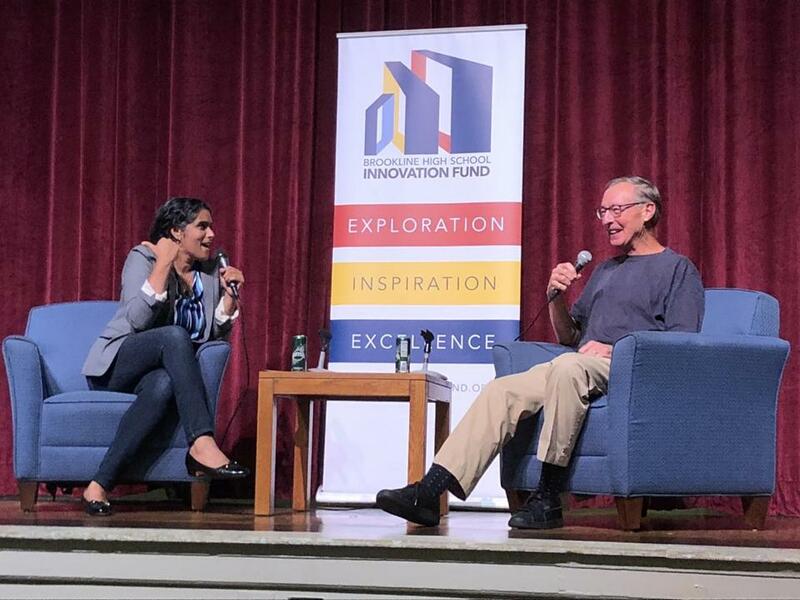 Meghna Chakrabarti of WBUR spoke with Ted Dintersmith at Brookline High Thursday night. Speaking to a crowd of more than 300 people at Brookline High School, author and innovator Ted Dintersmith praised Brookline Public Schools for empowering students and encouraging teachers’ creativity. He lauded the fund, which uses private grant money to create course programs on topics ranging from engineering, to global leadership, to racial awareness. Such programs give Brookline students a “real sense of purpose and a set of skills that are relevant,” he said. It is the only educational model he has seen, “where kids actually design, make, invent,” with “really great directionality” from instructors. Brookline High senior Peter Rachlin, said he took a course last year on social justice leadership, and got “a lot of real world experience” from it. “[I] had a lot of my ideas challenged,” said Rachlin, who was seated at a table with other students discussing his class with people who attended the talk. Dintersmith was invited to Brookline High to discuss his recently published book “What School Could Be.” In a single school year, he visited schools in all 50 states, to identify challenges and innovations in American education. Brookline schools are not featured in the book, but Dintersmith noted “This district is admired,” across the state. In his talk, Dintersmith identified two general problems for educators: new technologies that are rapidly changing what kids need to learn, and the need for schools to constantly adjust their curriculums to keep up with innovation. “How does an existing school make progress?” he asked. Dintersmith, who is based in Virginia, is a former partner at the Charles River Ventures in Cambridge. In 2015, he produced the documentary “Most Likely To Succeed,” which examined the impact of standardized testing in education. The film was featured in GlobeDocs Film Festival, sponsored by the Boston Globe during HUBweek. During the conversation, Dintersmith criticized state standardized testing as a way to rank students. “I’m very skeptical that they’re helpful for higher grades,” he said. He said that the state’s MCAS test questions are not good indicators for students’ skills and progress. Dintersmith also took questions from the audience. Patrick Tai, of Cambridge, who tutors middle and high schoolers at the Cambridge Rindge and Latin School, asked for advice on how to let kids learn what they want, but also teach the basic curriculum. “They’re covering a lot of material, but are they actually learning it?” he said. His views resonated with Brookline teachers. “The message of trust was particularly powerful,” added Lisa Lamont Harris, a Brookline teacher for 22 years and has three children in the school district.